Appearance: Alwyn bears an overall rugged appearance. Standing no taller than six and a half feet, he bears the stocky and rather muscular build that many Svefra claims. His skin would be fair if it wasn't constantly tanned from Syna's gaze, but he himself thinks he'd cut an odd sight if he was anything but. 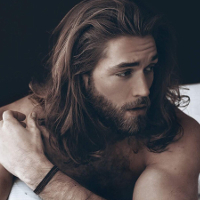 He is admittedly a rather hairy young man, obvious from the easily noticeable and dark hair covering his forearms and chest. Fortunately, Laviku blessed him with a lack of physical abnormalities or deformations, giving him a robust physique with the potential to be as strong as the sea he calls home. A sailor to his very core, Alwyn is far from shaven like some land-dwellers, instead opting to let his hair grow some past his shoulder. A full beard (and mustache, of course) covers a strong jawline and equally built chin, neither tamed nor wild. Possibly most noticeable about him is his incredibly blue, incredibly expressive eyes. Their color could be described as a shifting reflection of the sea: blues, greens, and greys writhe about each other in a dance spurred on by what light happens to glance off of them. Alwyn is a Svefra. That is to say, a footloose and fancy-free sailor of the Suvan Sea. He is a rough and rugged young man with a healthy and obvious love of the sea and all its inhabitants. He's a rather aggressive and belligerent individual, uncouth and wild yet far from cruel. A walking slab of unkempt masculinity with a boat, if you will. - Alwyn was born on the coast of the Suvan Sea, closer to Riverfall than any other piece of civilization, in the cabin of the Lia of the Softshell Pod. He was the son of the matriarch and one of her lovers, the product of peaceful nights on the Suvan. - Like all Svefran children, he was raised by the entire pod and their Tavan, but his father was a bit more territorial than most and did the majority of the child-rearing himself. It wasn't to the point where the other pod members thought too much of it, or any sort of drama occurred, but Alwyn was usually in his father's presence. - Alwyn's father was a rather severe man. While the Pod he joined was a rather peaceful and joyous one, the man wasn't ever really joyous or as happy and content as everyone else. As such, Alwyn's upbringing was rather hardened and focused on making him into his own man, which is something that (luckily) came easily to Alwyn. - Near the end of winter, Alwyn's father was eaten by a particularly ferocious sea predator. While it wasn't an unusual occurrence, the event still rocked Alwyn to his core. He refused to shed a tear to the fact, but it was obvious to everyone in the Pod that he was in pain. In an attempt to help ease his pain and emotional duress, the Lia gifted his father's well-kept casinor to the boy. It had been less than a day after when the boy departed in the night, eventually taking his own surname to create a Pod more like what his father wanted. Marked individuals can first and foremost spot Otani readily. Otani will recognize them and often seek them out to play and communicate. Individuals with one Laviku mark can also drink salt water and have the mark automatically convert it to fresh water for ocean survival. Individuals know the direction of the sea if they are on land and how far away it is (in aprox miles). They also immediately recognize where progression tide is, meaning if it is incoming or outgoing or in transition between. Heirloom: A cold iron trident. Handed down to him by his father, who taught him what little knows of wielding it as a weapon to hunt and to kill. which he's been meaning to find and mount onto the bow.